The cadets of the Portsmouth Division RMVCC often appear in public and have been lucky enough to feature on television and in the national and local press. A detachment of Royal Marines Cadets, along with some of their Royal Naval Cadets friends, attend the memorial service for HMS Sheffield to commemorate her sinking 35 years ago. Three cadets presented wreaths to dignitaries including His Worship the Lord Mayor of the City of Portsmouth, Cllr David Fuller. Cadet Bradley Stroud, 12, was one of a number of RM Cadets from Portsmouth Division RMVCC to stand guard at the City’s Cenotaph on Remembrance Day 2016 during the national two minute silence and the following service. Read more here. Our cadet Field Gun crew made the long journey on the bank Holiday weekend in 2016 to the small town of Kirkcudbright in Dumfries and Galloway. Each year the town has a searchlight tattoo as part of its week of Summer Festivities, and the cadet field gunners put on a thrilling display that certainly got the crowd cheering. Visit the Kirkcudbright Tattoo You Tube video to see our cadets in action. C adets and staff from the Portsmouth Division RMVCC attended the 2016 Bedhampton Summer Show whereupon the Cadet Field Gun crew were yet again in action entertaining a thousands of visitors to the show. The recruiting team were also out in force and despite the wet summer weather a good day out was had by all. Pompey legend Alan Knight was guest of honour. Visit The News for more information and pictures of this local event. Cadets and staff from the Portsmouth Division attended the annual Remembrance Sunday Parade at Portsmouth Guildhall, and featured in The News. The Portsmouth Division RMVCC Field Gun crew represented the unit at the Southsea D-Day commemorations on Sat 7 Jun 14 by competing in a specical competition run with the cadets from HMS Collingwood VCC. Their efforts were recorded by the Portsmouth News, which must have had a positive effect as they were the winners. We were also represented by CSgt Jim Coomber and CSgt Mick May at the Veterans Parade on Southsea Common on Thu 5 Jun 14 and by a number of cadets at the D Day Remembrance Service on Sun 8 Jun 14. With attendance by four cadets at the Commemorative Dinner the night before, over 45 cdts attended the 2014 Cockleshell Heroes Commemorative Parade at the RM Museum in Eastney. On a day of changing weather (albeit sunshine for the actual parade – as booked of course!) a full detachment of cadets, VIP party, markers and standard bearers (both of our Colours proudly on parade alongside the RMA Standards) made a huge impression on the assembled Old Comrades and spectators. The Guest of Honour was Dame Mary Fagan DCVO JP and the parade included a Service of Remembrance and a March Past led by the Band of HM Royal Marines Portsmouth. This was the first time any representatives of the Corps had paraded on the Parade Ground of our ancestral home at the former Royal Marines Eastney barracks since December 1991 when Portsmouth RMVCC was the last Corps element to match out. Watch the BFBS news report of the event. The Corps of Drums of the Portsmouth Division RMVCC appeared on the Alan Titchmarsh Show as the first RM350 event in this special year for our Parent Corps. With our Colonel Commandant being interviewed, and Cdt BdSgt Joe Stevens giving Alan some impromptu drumming lessons, the cadets did the Division proud on prime time television. As usual, P ortsmouth Division RMVCC sent a detachment of cadets to the Guildhall in Portsnouth for the annual Remembrance Sunday parade. This year the cadets were photographed and featured in the online edition of the following day’s Daily Express alongside photographs of HM The Queen, the Prime Minister and serving personnel. Cadets also attended the service at the Royal Marines Museum in Eastney, and parade with the RMSM band and Old Comrades. Our 2013 reunion got some attention in the local paper as The News published a long lost photograph of our cadet field gun crew running in a competition in 1972. A memorial to the Cockleshell Heroes was unveiled by Lord Ashdown at the Royal Marines Museum, Eastney on Sun 4 Nov 12. Attended by the Commandant General Royal Marines, members of the Royal Marines Association, the families of the Cockleshell Heroes and other distinguished guests, the former Liberal Democrat leader and ex-Royal Marine unveilied a stone memorial and laid a wreath to commemorate Op Frankton, the raid in December 1942 on enemy shipping in Bordeaux. Portsmouth Division RMVCC provided a marching detachment, VIP & wreath party and working party as part of its support to the RMA at this event. Did you know……that the Portsmouth Division RMVCC band appeared in the 1950s film ‘The Cockleshell Heroes’? The Portsmouth Division RMVCC Field Gun teams performed four runs at the 2012 annual Bronte Vintage Gathering (about 10 miles west of Bradford), giving a thrilling display of competitive teamwork to the assembled audience. We made good friends with the RM Cadets of SCC Keighley, although probably didn’t impress the farmer in whose field our coach became stuck! However, it was a great weekend away and good start to the 2012 Field Gun season. The Portsmouth Division RMVCC Field Gun Crew was again in action out and about in our local community when they displayed their skills during commemorations to mark the 30th anniversary of the Falklands War. Click here to see how The News reported on the appointment of new Lord Mayor’s Cadets including our own Richard Morton. The Field Gun team made a long trip up to Cumbria in July 2010 to compete against the former HMS Dolphon VCC at the Cumbria Steam Fair, in Flookburgh, near Barrow-on-Furness. After both teams won one race each, all the cadets were looking forward to the decider on the Sunday. Alas, the heavy rain overnight and into the morning meant for safety reasons the final run was cancelled and a draw was called. At least we got to head home early. 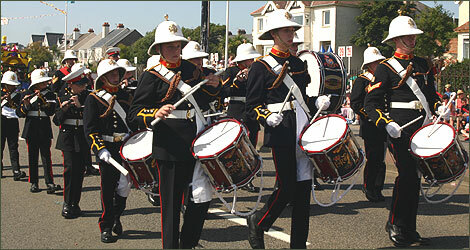 The Portsmouth Division RMVCC band travelled to Jersey in 2005 to appear at the island’s annual Battle of the Flowers carnival. The band appeared twice during their stay, as well as taking time out to visit local attractions. The cadets enjoyed rave reviews from many spectators, as well as the organisers, during this major local event,. They were also rewarded with good coverage on the local BBC website (just Google ‘RMVCC Jersey’ to see more).